Complimentary light lunch and tea & coffee supplied. Landscape Aficio’s will have a fun time delving into the techniques and influences that make a vista work as a painting. Aerial perspective can break a painting if it’s not understood and used well. We will go through just what is AP, how it works and how it works for artists. We get to play with the painting tools of edges, tone, colour, temperature and mood then see the effect these have on a painting. There will be a few exercises to develop, all explained and discussed, then a demonstration step by step for you to participate in and follow along. Finally using your reference photo, apply this new knowledge and skills to a fresh pastel painting and see the results. Just what is colour harmony? How does it work? Can it really make a difference to your painting? All these questions and more are answered in this skill building workshop. Colour harmony is explained demonstrated. See how it can enrich your finished painting, limit your palette and provide unity; as you the artist understand how this powerful tool can behave for you. Karol Oakley is a very experienced and sought after international tutor, artist and plein-air devotee; who generously shares what she knows and loves about pastels and painting. 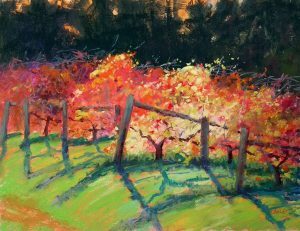 Her workshops are structured to help those new to pastels or wanting to further develop their skills and confidence. Karol’s workshops are informative and fun, with the often heard comment of “oh I learnt so much”. Tutoring is with step by step demonstration, explanations, and discussion with equal time individual help.